Northern Queens residents who want to safely bicycle to nearby parks are trying to convince the city to install new bike lanes in neighborhoods from Astoria to Corona. It all started with a post by Sergio Peçanha to a Jackson Heights neighborhood forum about two weeks ago. With Travers Park and the adjacent 78th Street play street set for reconstruction soon, Peçanha wanted to bicycle with his kids to other parks instead. Soon, other local residents joined and began calling their campaign the Queens Bike Initiative. “We’ve been doing everything through email. We’re excited to get on the ground,” said Alexia Tate, a Jackson Heights mom who began bicycling a year ago and teaches music classes throughout Queens. She heard about the effort through a parents’ forum. The advocates would like to see new greenways and protected bike lanes running as far west as the waterfront in Astoria and Long Island City and as far east as Flushing Meadows Corona Park. 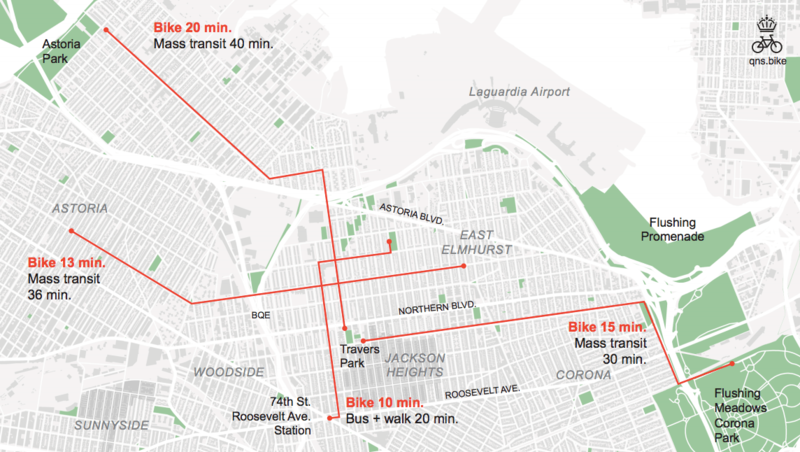 The paths could connect residents in Steinway, East Elmhurst, Jackson Heights and other neighborhoods to nearby parks and provide a safe way to make trips that take a long time by subway or bus. So far, the group has met with members of the Transportation Alternatives Queens committee and read up on existing efforts to secure new bike lanes. Up next: Meeting with elected officials and community boards. The group has also started a petition directed at DOT. The group is hosting a ride on Sunday — the same day of the Tour de Queens — to scope out potential streets for bike lanes. It meets at 11 a.m. at the Travers Park greenmarket composting and fabric recycling booth, on 78th Street near Northern Boulevard. A previous version of this post incorrectly attributed a quote about working with public officials and community boards to James McIntyre. The quote has now been properly attributed to Alexia Tate. Streetsblog regrets the error. These would be ideal routes for Bike Boulevards. These are streets where bicycles and cars use the same space but car traffic is local access only (ie cars going to the houses/apartments along that part of the street only). Barriers are placed every few blocks to ensure that drivers cannot use these streets for through-traffic. This concept is widely deployed to keep traffic out of residential neighborhoods in The Netherlands. These have also existed in other bike-friendly US cities for decades but NYC is that far behind. What I would like to see is a safe route between Flushing and points west. Northern Blvd has a protected path on the bridge over Flushing creek, but after that I think it’s pretty much a barren semi-highway section of Northern Blvd. Roosevelt Ave is another street I would not care to bike on, and a cyclist was killed on Roosevelt between Flushing and Citi Field a year or two ago. Both roads have significant stretches that are desolate areas that encourage speeding and recklessness. Roosevelt Ave between College Point Blvd and 111th St should at least allow cyclists on the sidewalk. Au contraire! Cross Nthn Blvd Br westbound, W on Flushing Bay Promenade, exit at end (near Delta terminal), cross Ditmars Blvd, W on 27 Ave, S 1 block on Humphreys, W 1 block on 29 Ave, cross Astoria Blvd, S 1 block on 102, W on 31 Ave, under BQE, eventually you get to Socrates Sculpture Park. I agree with you about Roosevelt Ave, however. I’ve used such a street in Tucson, Arizona. Unfortunately, I don’t think New York City is forward thinking enough to allow anything so radical. Done! Although I wish it was a more explicit “ask” for Class I protected bike lanes. I’d hate to see sharrows. I’m not sure parents would allow kids to ride on a Bike Boulevard in NYC. I know I wouldn’t. If you wouldn’t let them ride on a residential side street with almost no traffic, where would you let them ride? Sure, the tennis tourney generates revenue for the city, but Queens residents are treated like garbage for three weeks.